At Shillo residence Ein Hod village center. "Salach A'Din" Oil on canvas 50 x 100 cm. $2,000. 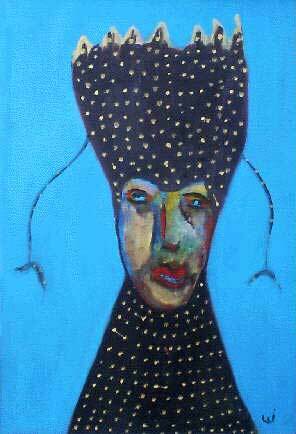 "Gold Doted Hat" Oil on canvas 70 x 47 cm. $1,500. "Square Outfit" Oil on canvas 50 x 100 cm. $2,000. "Stripes on Hat and Coat" Oil on canvas 50 x 100 cm. $ 2,000. Sep. 1987 Los Angeles. "On the first day of the Yom Kippur war to the light of candles at night, on the floor using a canvas and a piece of plywood, I started to paint. Was it the shock of the unknown which led me to the subconscious urge to paint faces, or was it the inspiration from being a veteran member at the artists village Ein Hod?" Itzhak Michael Shilo has acted in a large variety of leading roles in the National Theater of Israel, Habima, The Cameri Theater of Tel Aviv, and the Municipal Theater of Haifa. In the USA he acted on Broadway, off Broadway, the Los Angeles Theater Center and in Burt Reynolds Theater in Florida. He also acted in numerous films and on Israel's National Television, Europe and USA Television. His most recent movie is Orions "No way out of music box". In the "Father and his Daughter" Exhibition at Habima's Foyer Tel Aviv, the veteran actor Michael Shilo displayed paintings of faces in oil and acrylic, with his daughter, Tamar Shilo exhibiting abstract paintings and sculptural three dimensional elements. Tamar Shilo manages Itzhak Michael Shilo's estate.